Approx. Weight: 5 lbs. 9 oz. What a great grilling assortment and indeed a classic for each and every grilling enthusiast. From ribeyes to burgers - all wonderful angus wet-aged beef. Click here for tips on how to cook your steak. 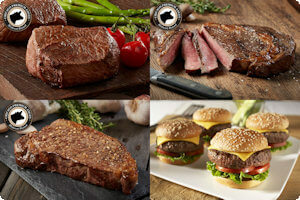 This American Griller assortment comes directly from Chicago Steak Company and you can rest assured you are giving high-quality American meat, hand-cut, Mid-West raised, Premium Angus USDA Prime beef.